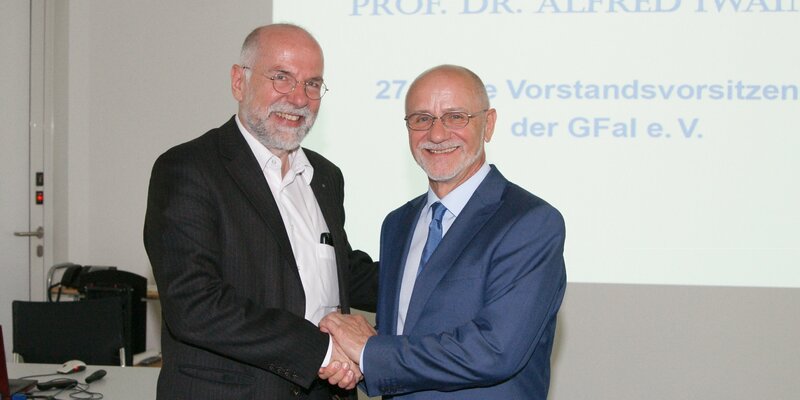 The new Chairman of the Board of GFaI Prof. Dr. Holger Schlingloff (Humboldt University Berlin) and the deputy Chairman Prof. Dr. Alfred Iwainsky (GFaI e.V. ), former Chairman of the Board for 27 years (f.l.t.r.). Mohr / GFaI e.V. Prof. Dr. Holger Schlingloff, Chief Scientist at the business unit Quality Engineering (SQC), has been elected as the Chairman of the Board at the general meeting of the Society for the Advancement of Applied Computer Science (GFaI). The GFaI is a private non-profit research institute for applied computer science with about 100 company members from research and industry. Outstanding products from the GFaI are, for example, an Acoustic Camera for localizing and measuring acoustic sources, a facility management system for planning and operating safety systems in buildings as well as a forensic image database for shoe tracks and shoe sole patterns. Through the election of Holger Schlingloff as the Chairman of the Board of the GFaI, Fraunhofer FOKUS is improving its network with the research landscape in Berlin-Adlershof and the possibilities for joint research projects. GFaI was founded in 1990 and is a research institute with worldwide activities. It is based in the Technology Park Berlin-Adlershof.